In what seemed like an easy run chase for India, the Sri Lankan bowlers made the Indian batsmen struggle for runs before the hosts secured a 3-wicket victory. Earlier, after being asked to bat first, the visitors lost the plot initially, but some good work later helped them get to a score of 135/7. Brief Scores : Sri Lanka 135/7 (Asela Gunaratne 36, Dasun Shanaka 29; Jaydev Unadkat 2/15, Hardik Pandya 2/25) lost to India 139/5 (Manish Pandey 32, Shreyash Iyer 30; Dushmantha Chameera 2/22, Dasun Shanaka 2/27) by 3 wickets. After winning the toss for the first time in the series, Indian skipper Rohit Sharma decided to bowl first, keeping the usual winter dew in mind, and declared that India had made two changes to the squad bringing in Washington Sundar and Mohammed Siraj in place of Yuzvendra Chahal and Jasprit Bumrah. Sri Lanka, too, announced that Danushka Gunathilaka and Dasun Shanaka had replaced Chaturanga de Silva and the injured Angelo Mathews for the game. Washington Sundar, who impressed all and sundry in the IPL due to his ability to bowl in the power play overs, bowled an economical opening over to get things started and Jaydev Unadkat capitalised on that by dismissing Niroshan Dickwella who miscued a shot to mid-on to get out for 1. Sundar’s persistence to bowl in the channel reaped dividends when Kusal Perera chipped straight back to him to hand his debut T20I wicket. It seemed like watching a highlights package as Unadkat dismissed Upul Tharanga in the next over to bring the visitors down to 18/3 within three overs. However, Sadeera Samarawickrama and Asela Gunaratne tried playing to the merit of the balls after that and didn’t go for flashy shots that helped the team reach a score of 37/3 at the end of the power play. The moment it seemed like the duo could actually lead the hosts to a competitive score, Hardik Pandya broke the stand as Samarawickrama mistimed a lofted hit to be caught by Dinesh Karthik and as a result, the Lankans could manage a score of 67/4 at the mid-way mark of the innings. It seemed like a cakewalk for the hosts in the next three overs as Danushka Gunathilaka continued the procession by becoming the next scalp to fall to the wrist-spinner before Siraj picked up Perera to reduce the visitors to 85/6. The hosts found themselves at a position of bringing the Lankans innings to an end within some minutes but that was delayed as the duo of Gunaratne and Dasun Shanaka rotating the strike to take the score past 100 runs. The duo wereimpressive with the way they managed to strike some boundaries on the on-side off the chinaman bowler, but their failure in scoring runs quickly made sure that India would not have to be too worried in the mid-way break. It seemed like they could only manage a score between 125 runs, but Siraj, who was having a torrid time in the middle, gave away 18 runs in the final over that took the visitors to a decent score of 135/7 in 20 overs - much better than what they would have hoped for after losing the first four wickets. Surprisingly, the visitors, unlike last matches, bowled with a lot of panache and the Indian openers looked uncomfortable against them. While Rohit Sharma was in his elements, Rahul found the things tough and was caught plumb in front scoring 4 runs. His dismissal brought Shreyas Iyer to the field and the local lad, playing with caution, got off the mark as the duo continued to deal with singles and occasional boundaries. But, the introduction of Shanaka changed things dramatically as Rohit was dismissed for 27. Although Iyer, along with Manish Pandey, continued to ply his trade for some time, the duo needed to score runs to restrict the required run-rate rate from going any higher. But unfortunately, for them, both Thisara Perera and Shanaka bowled at the off-stump channel and didn’t allow them any room to go for any big hoicks as India reached 56/2 at the end of 10 overs, needing 80 runs to win in last 10 overs. While the target was still very much in sight, the Indian batsmen needed to play positively to ease the pressure on their shoulders, but they seemed to make a mess of the run-chase as Iyer was ruled run-out when Akila Dhananjay got a hand on a Manish Pandey drive that hit the stumps on the non-striker’s end that reduced India to 81/3. But that failed to deter Pandey as he hit two boundaries in the next over to keep India in the run-chase. 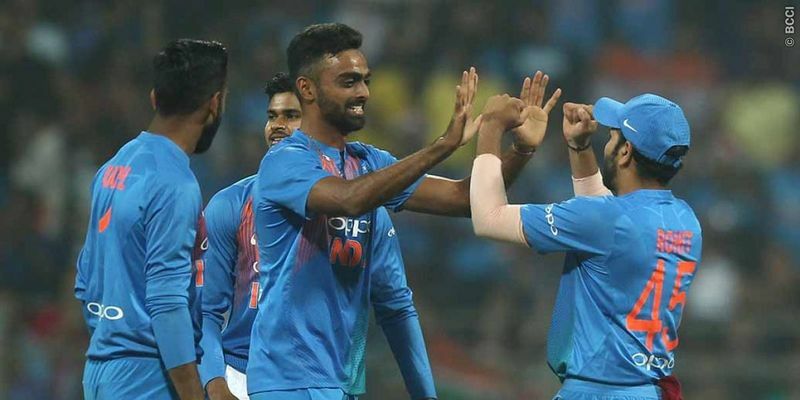 But Pandya, on the other end, edged to the wicket-keeper before Pandey missed a glorious opportunity of finishing off the game as Chameera castled him to send the entire Wankhede crowd into stunned silence. The game was evenly poised by then and all hopes were pinned on MS Dhoni and Dinesh Karthik to take the team down the line. The duo initially dealt with singles, but Karthik hit a massive six on the last ball of the penultimate over to bring the equation down to just three required off the last over. After a double, that resulted from an over throw, Dhoni finshed the game off with a boundary.